The state of Florida is a place for catching big fish, and this year is no exception with record goliath groupers, big marlin and shark attacks. We’ve seen anglers pull up big fish in extraordinary ways, like the guy who snagged a 552-pound goliath grouper from a kayak earlier this year. 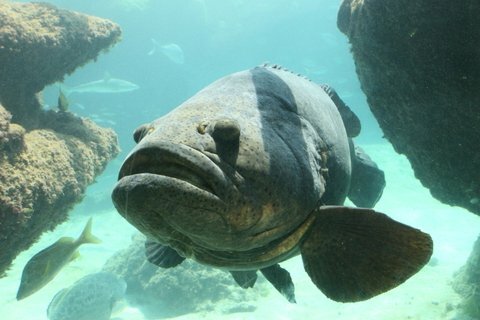 Now a Florida angler caught a goliath grouper on a paddleboard. The 7-foot goliath grouper caught by Ben Chancey off Cape Coral, Florida weighed 412 pounds, reports the Weather Channel. Although paddleboarding is one of the fastest growing outdoor sports in America, few people have been recorded catching a fish on one of the boards. Chancey, who runs a charter service, believes he may be the first to catch a fish so big.